Increased the amount of currency rewarded for the Kralet Penumbra Attacks! public quest. Corrected a bug that allowed extra rewards to be granted from Search and Destroy in Tranquil and Phantom seas. Crusader’s Medals are now rewarded from the level 95 version of The Crusade in Jarsath Wastes. Two pieces of news from yesterday and today. We are looking into the issue. For now we have locked the BG server so no more folks get stuck loading. If you have a character stuck send me a Private message with server/character name and I can see what I can do. We’re aware of an issue with krono purchases, which is causing long delays between when a purchase is made and when krono is delivered. It seems like krono delivery is currently taking up to 48 hours. Our team is aware of this issue, and it currently working towards solving this. Introduced as an addon feature fourteen months after the game’s launch, Player vs Player combat in EverQuest II has always had an identity crisis. In spring 2006, open-world PvP was bolted onto EverQuest II’s core game through the introduction of several open world PvP or “red” servers — Darathar (UK), Talendor (DE), Gorenaire (FR), Venekor (US RP), Vox (US), and of course Nagafen (US). In 2009, the population of Venekor, a RP PvP server, was merged with Nagafen. With the collapse of LiveGamer player auctions in 2011, Nagafen absorbed the Vox population. 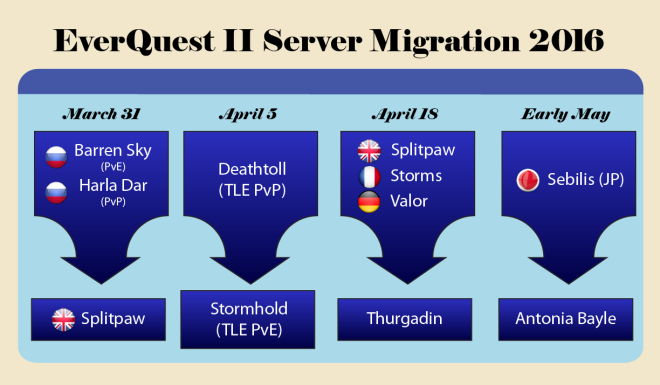 With last summer’s launch of Deathtoll, a Time Locked Expansion PvP server with travel restrictions, limited escape options, and access to Battlegrounds almost completely blocked, things were looking up for open world PvP. 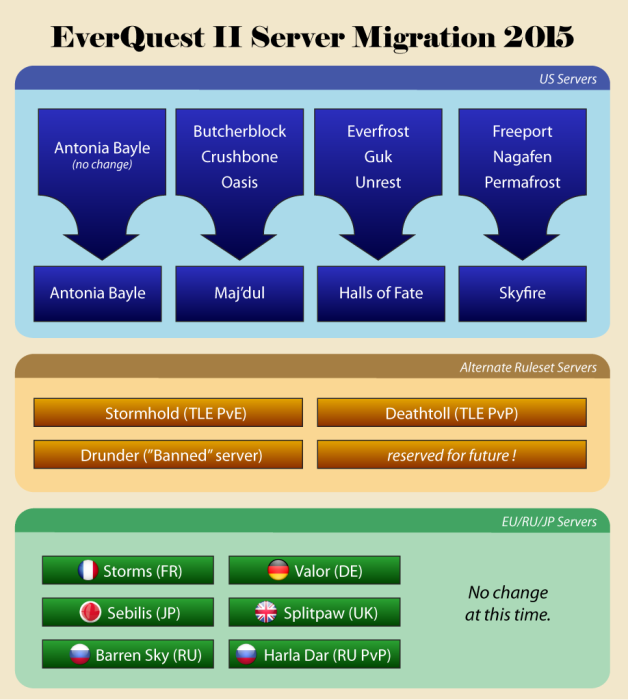 Thousands of TLE PvP characters were created within hours of the server’s launch. It briefly seemed like a second TLE PvP server would be needed, and indeed the name Bonemire was reserved, later depriving the consolidated Butcherblock/Crushbone/Oasis server from a non-punctuated name choice. Yet despite massive early enthusiasm, the underlying problems of a bolted-on system remained. EQ2 was never designed for PvP and despite sometimes Herculean efforts over the years to maintain a semblance of balance, skilled players always find the right combinations of class, gear, and abilities to make them unbeatable, frustrating others until they leave. With the departure of more and more well-meaning but outmatched cannon fodder, the remaining kings of the mountain squabble over titles and wonder why their easy prey has permaquit. PvP’s shrinking audience may ironically be attributable to listening to player feedback by EQ2’s developers. On more than one occasion, an extremely vocal minority has dictated forum discussions which led to hefty PvP patches that only relocated PvP lopsidedness rather than stamping it out. Regardless of who or what is to blame, PvP’s 10 year run in Norrath seems to be at it’s end. On April 9th, Deathtoll will merge with Stormhold (the TLE PvE server currently unlocked up to the Kingdom of Sky expansion). Harla Dar, the Akella Online-managed Russian PvP server, will be folded into Splitpaw on March 30th. Cross-Server Battlegrounds will remain for those who need their PvP fix. Fixed an issue where killing players on your recent kill list was not being processed correctly. Upcoming Server Consolidations – Vote on YOUR New Server Name! There’s no word on how character names will be reserved, as that is probably still being hammered out, but the most notable news today will likely be that Nagafen is merging into Freeport and Permafrost. This is not really surprising given how few players were logged in even at peak hours (maybe 30-40?). Deathtoll has shown that PvP can be very popular in EQ2, if the ruleset is right and there are limits on travel convenience. Fixed a client issue with animations taking too much memory after running the game for a long time and zoning around a lot. You no longer get an experience penalty if you are unable to get a hit in on an NPC that your group kills. Fixed a bug where PvP KvD stat [a new leaderboards stat] was not exporting with decimal places to census. Harvesting time has been reduced by 50% for players who are adventure level 10 or above. [eq2u]Dire Balm IV (Adept)[/eq2u] and [eq2u]Dire Balm IV (Master)[/eq2u] will once again drop. The Rescue of the Green Hoods should more reliably update now when rescuing the captured Green Hood women. If on the quest, Fire and Ice, all 3 shards must be used before Lady Vox will appear. Fixed an issue where consumables could give incorrect bonuses after zoning. The payments made by the exiles to buy off non-city guards have expired. Non-city guards will no longer assist exiles in PvP combat. Ravens’ Roost has hired a few high level guards. Deviator Yothsra can once again be slain. Summoner pets will no longer apply state effects in PvP combat. Woven Rawhide armor has had its tint corrected. Winds of Obol adornments have been rewritten to grant a flat 25% Potency for each group member who has one adorned. They can be used alongside Truespirit’s Legacy. This replaces the old buff which granted +25% potency but only to offensive spells and combat arts. The old effect frequently dropped on zoning and was the subject of numerous bug reports.